Is the architecture of religious buildings in the Alps specific to the various mountain cultures ? By and large, the answer is no, even though, here and there, some organisations took advantage of territories along significantly travelled roads that encouraged more than elsewhere the meetings of people and ideas. The pre-Romanesque church of Saint Laurent, nestled in the heart of one of the oldest quarters of Grenoble, recently reopened its doors following years of research. The new Archaeological Museum, in an original presentation, tells the story of the site over the past 15 centuries. An interesting encounter with local inhabitants, their beliefs and the long history of the city. 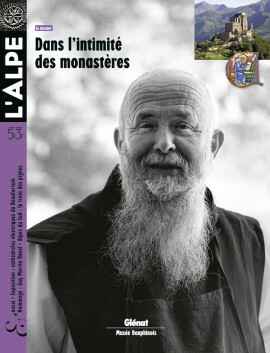 In the Chablais region and elsewhere in the Alps, throngs of monks set off to the mountains in search of isolated spots conducive to their new spiritual quests. 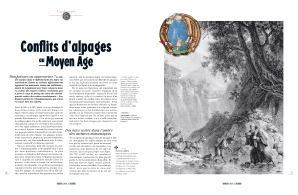 Starting just after the year 1000, the backwaters of the Haute Savoie became a true laboratory for monasteries to the greater advantage of the local nobility who were quick to welcome the monks and use them to consolidate their territorial strategies. Benefactors or oppressors ? The role played by monks in settling the Alps is a double-edged sword. At times, violent struggles opposed the newcomers and the inhabitants, at times they organised hand in hand the development of the high valleys. Occasionally, the monks joined forces with the mountain people to fight off invaders. History is full of unexpected events that contradict many preconceived notions. Our review, born and bred in two former monasteries in Grenoble, could not help but benefit from the consecrated walls that radiate a certain spirituality. During the Middle Ages, there were legends galore about the saintly life led by hermits. However, the archives suggest that their living conditions had little to do with exemplary ascetic behaviour in poverty, far from other people. The Tyrol, in particular, was home to many hermits up until… 1996 ! An often unknown and occasionally surprising aspect of religious history. Photography and monastic life would not seem to work well together. Yet Bruno Rotival succeeded in transposing, with great humility, the timeless rhythms of this very special environment. Showing work and prayer, smiles and meditation, the darker and lighter sides, the images bear witness to true complicity. There are very few accounts of daily life inside a monastery. Here at L’Alpe, we were privileged to work with a photographer of unparalleled modesty who, as a young man, spent eleven years in the Grande Chartreuse monastery before deciding to go on to the Musée dauphinois. Excerpts from an unpublished document. Monastic products are all the rage ! Here you will find our best addresses, both on the internet and in real life, to discover the Alps following the ways of the unknowable which, contrary to the expression, are not always impenetrable. Céline Clanet shoots the portraits of men and women at hydroelectric power plants in the Beaufortain region just like she photographs the Sámi de Máze people in Lapland, that is with her double approach as both an ethnologist and an artist. We published the photos of Guy Martin-Ravel in the very first issue of L’Alpe in October 1998, in the article Walking and suffering so… written by the photographer himself and addressing the living conditions of men and women who, until then, had never been the topic of a mountain magazine. Guy was a good friend of us here and he died in April. The history of the train line from Digne to Nice is rather strange. It was not even part of the original project, then it took 30 years to build, but today it is the only remaining section of the Southern France train network.